This is the second Premio Strega award-winning novel I have read in as many weeks. It will be tricky to review because it made me sad, and the first half was harder to work through than the other Italian books I read in one evening. Part of the problem could be that the narrative comes to us from a man’s perspective, even though the novel is written by a woman. That shift is almost always hard for me to believe. How does she know what a male surgeon in oncology feels for an ugly woman with a high forehead? The portrayal of their love did not at first ring true to me, or perhaps I would feel it more authentic if we were to hear their story from the woman’s point of view instead of his. Don’t Move begins when a fifteen year old girl is suddenly struck by a car while riding her scooter to school. She is barely alive when she is rushed to the hospital, and it appears that she is suffering a brain hemorrhage. While the hospital staff is administering to her, a nurse discovers her name in a school notebook. This girl is the daughter of one of the chief surgeons. He is immediately summoned from an operation he is conducting, and while waiting for the outcome of her surgery, after phoning to inform her mother who has flown to England on business, he reviews his personal life which contains a deep secret. Before his daughter was born, Timoteo began an affair with a woman whom he happened to see in a roadside bar when his car broke down on the way to his wife at their beach house. The woman wears too much make-up, is far too thin, has heels too high and a forehead too prominent. Yet rather than repulse Timoteo, he finds himself inescapably attracted to her. She is completely different from his educated and beautiful wife, who has a shapely figure and powerful career as a journalist. The more we read of his lover, Italia, the more waif-like she seems. She was raped when she was twelve. She works any small job that she can find and lives in a small apartment with pathetic belongings scattered about; a poster of a monkey with a baby bottle, objects cluttering the surface of her dressers, a dog who is blind. Yet she is humble, eager to please him, and unwilling to believe that she is worthy of his love. Through Timoteo’s attentions, though, she is drawn into their relationship with abandon. Her love for him becomes real, and tender, and heartbreaking because we sense deep down that in cannot last. It cannot compete against the place of his wife. Especially when she becomes pregnant. And yet, unbelievably, their love does last. Timoteo knows he cannot leave his lover, knows that he must be by her side, even though he is a new father. He leaves his wife and newborn daughter in the maternity ward, and drives Italia south where he plans to set up a life with her. Tragedy has a way of intervening. It sneaks in unannounced to those who are ill prepared, and robs us of our plans. Our dreams. What we have decided, futilely, that our future should be. I wonder if all Italian novels are so visceral. 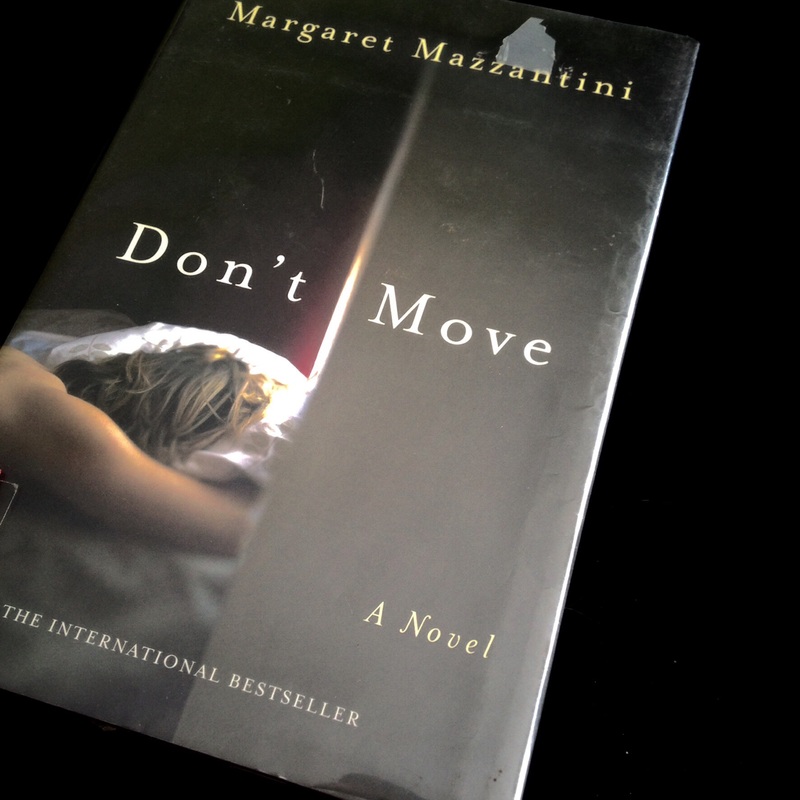 Every one that I’ve read lately: Swimming to Elba, Quiet Chaos, I’m Not Scared, and now Don’t Move have been written with barely contained emotion telling stories of our deepest pain. They are powerful novels, a welcome respite from the Japanese who tend to portray a slice of life. Or, contain elements of magical realism which seem so at odds with the characters’ ordinary lives. I’m continuing my foray into Italian literature with another Ammaniti novel, and a third Strega award winning novel titled The Solitude of Prime Numbers. I hope to have those finished by the time the IFFP long list is announced in March, for then it will be straight march ahead toward discovering whom we, the Shadow Jury, deem the winner. Until then, and probably after then, I cannot read enough Italian literature to appease this ravenous appetite. I so LOVED, The Solitude of Prime Numbers; hope you do as well. I can’t wait to read The Solitude of Prime Numbers! I’m racing through the books for which I’ve promised a review (why do I do that?!) to get to it before it’s due back at the library. Probably I’ll end up buying my own copy. Thanks for the affirmation of your admiration for it, too! Another interesting book that is completely new to me! It seems you are enjoying your time with Italian literature, Bellezza. More than I can say! I didn’t know this was a movie as well! I can definitely see Penelope Cruz playing in it. I’ll look for it, as I was so happy to find seraillon’s recommendation of Grande Bellezza at our library. Who knows, they may have this too? As for The Solitude of Prime Numbers, I can’t wait to read that one. I always love the book more than the film. I like the idea of comparing Italian literature with Japanese literature. I can almost feel the difference! It’s such an interesting comparison, Terri. I find the Italian novels particularly full of angst; not that the Japanese don’t have their moments, but to me they are somehow more superficial. I can’t quite describe how the distress differs…surely most translated literature deals more deeply with human emotion and suffering than American literature seems to do. We seem, overall, more concerned with Romance and Mystery. Boring, rote and plot driven. I’m interested in your words about this Italian fiction containing words of deepest pain. I was looking forward to a little respite when I moved away from Norwegian fiction for a while. But probably a different kind of pain. I’m eagerly awaiting the arrival of Quiet Chaos. I wonder how much of a respite we can find, Gert, and even which country expresses the most painful emotion (in general). I haven’t read much Norwegian literature at all, other than The Sorrow of Angels which I’d mentioned to you. I’ve spent most of my time with Japanese literature, then Russian, then Italian. But surely there isn’t a country whose literature I don’t want to read fully. (No, I guess I can say I’ve read enough from the Middle East to last a lifetime. I’m about wrung out reading about their abuse of women and children.) At any rate, I so look forward to your thoughts on Quiet Chaos.